Enjoy breezy days with your toes in the sand at this inviting 4 BR, 2.5 BA vacation home that features fantastic ocean views and a suite of inviting extras. Situated in Kitty Hawk along the Beach Road, guests will be close to a host of local shops and restaurants, but will soon discover that its the ocean that steals the scene at Sea Spray. Guests can wash off sandy feet in the outside shower before heading upstairs and laying claim to one of four bedrooms on the quiet second level. 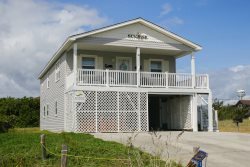 Theres also a large covered deck nearby with ocean views, and a gracious front entry. Upstairs, the family can reconnect in the bright and airy great room with living area with queen sleeper sofa and wet bar, nearby dining area, kitchen, a convenient half bath, and a laundry room. For a bit of sea spray, step outside to the large sun deck with picturesque ocean views a divine spot to catch an ocean sunrise with a morning cup of coffee. From the posh interior with ample space to stretch out, to the fantastic beach access just an easy stroll away, Sea Spray will leave every beach lover smiling. Discover how inviting a shoreside retreat can be, and reserve your stay at Sea Spray today! Approximately 50 feet to beach access.